The social loyalty framework is for specific tasks in gamification — from training, certifications, and special promotions to loyalty economies, gamified events, and tradeshows. This framework is all about tracking a variety of goals in parallel. 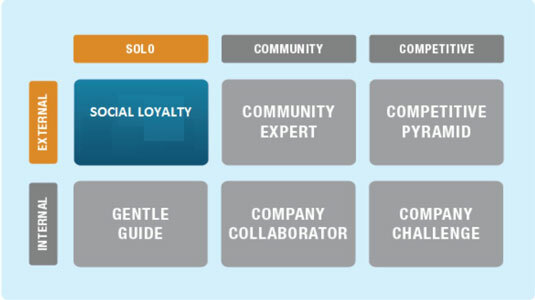 All social loyalty framework tasks have a beginning, a middle, and an end, and users are encouraged along the way, making progress, completing sets, and collecting gameplay accomplishments. Recognition: Humans have a basic need to be recognized for achievement. Recognition not only feeds this need but encourages engagement and ups the repeating of your customers’ behaviors in your gamification site. Visualization of progress: Users see what they’ve already achieved and what needs to happen to move forward. This ability to visualize where they’ve already been and where they’re going is important in keeping them engaged, retaining them, and encouraging them to return again and again. Rewards: Everyone values rewards — money, privileges, and recognition. The social loyalty framework works great with all types of gameplay rewards.